A curious phenomenon common to medical history and folklore is that of the bosom serpent – stories of snakes, frogs, lizards and other animals living inside the human stomach or intestines. According to the physician and medical historian Jan Bondeson, “no fewer than 68 case reports of live reptiles or amphibians inside the gastrointestinal tract” appeared in the professional literature between the seventeenth and nineteenth centuries. (Dr Bondeson has written a fascinating paper on the subject, which you can read here). A Russian peasant, by name Abraham Isajeff, of the district of Oranienbaum, aged 36, was suddenly roused from sleep under a tree, on the 27th of July, 1838, by the distressing sensation, as if ice-cold water was passing from his mouth to the stomach. The sensation doesn’t sound all that distressing to me, particularly on a hot day; but things were about to get a lot worse. Immediately afterwards he felt something moving in his stomach, and could even perceive the motion by the hand pressed on the part. The most distressing sensation was that of extreme coldness in the stomach; but the conviction that he had swallowed a venomous serpent rendered the poor man almost distracted. I have to admit that I would probably be in a bit of a state if I were convinced that I had swallowed a viper. He refused to eat for fear of nourishing it, and took tobacco, brandy, emetics, purgatives, etc., partly by the advice of his friends, and partly under medical direction, in the hopes of killing the animal, or of ejecting it upwards or downwards; but all in vain. Having failed to dislodge the creature (although presumably got it nicely drunk), Mr Isajeff sought medical attention. Strangely, medical students are not usually taught to recognise the sound of an enraged snake caught inside a patient’s intestines. Dr Selle was unable to suggest any form of treatment, so decided to watch and wait. The motions and sense of coldness continued in the region of the stomach until the 31st., when they seemed transferred to the umbilical region, and then were, for the first time, accompanied by a sense of local heaviness or weight. He thought he could perceive, on examining the abdomen, “a longish foreign body” in it, but was not quite certain. On the 1st of August the patient was also seen by Dr. Hassing, staff physician-general. This was the last day the patient felt the movements, or sense of coldness in the abdomen, but the weight still continued. The man being now convinced that the snake was dead, was roused from his mental agonies, recovered his spirits and courage, and began to eat. The doctors now wanted to extricate the snake’s mortal remains from inside the man’s body, so they gave him a variety of powerful laxatives. These succeeded in emptying his bowels, but no snake corpse was forthcoming. On the 7th of August the man went to see his family, promising to take his purgatives, and to examine carefully all his evacuations. He showed himself again on the 9th, but could not be kept from his own home any longer. He returned, however, to the doctor’s the following day, “happy and triumphant, exhibiting in a glass the expelled snake, covered with excrement,” which, he said, had come away from to in two pieces; the tail-end at three o’clock, and the remainder five hours thereafter. Nothing quite gladdens the heart like a dead snake covered in human excrement, does it? The only parts wanting of the animal were one side of the lower jaw, the rest of the head, and a small bit of the body between the tail and abdomen. 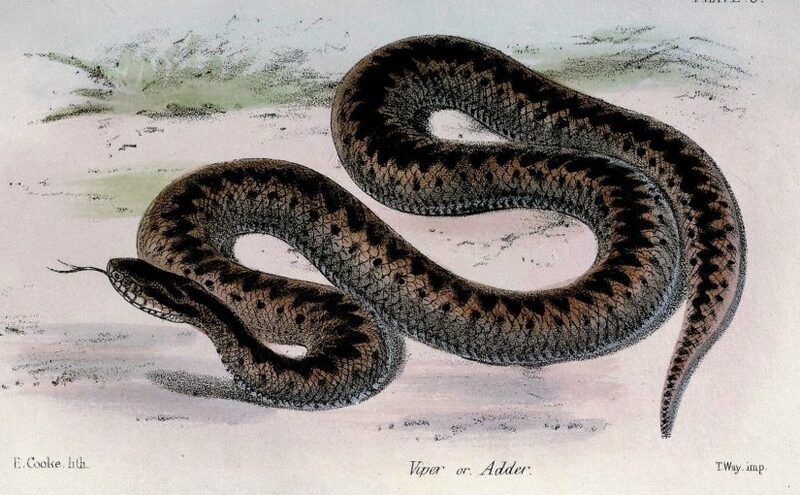 It was upwards of a foot long, and about the thickness of a full-sized man’s finger, and was recognized as the common viper (vipera berus), by its colour, the character of the tail, &c.
The common viper or adder is a venomous snake found in most parts of Europe. Adults are typically around 22 inches long, so it sounds as if this specimen was a juvenile. In several places the vertebral column was broken; and the skin everywhere exhibited marks of the digestive action, in loosened scales, etc. The internal organs were all sound. From the whole history of this case, so minutely detailed in the original, and also the character of the narrator and witnesses, it is hardly possible to doubt the truth of the narrative as above detailed. I wouldn’t be so sure of that, actually. Still it will not escape the sceptical, that the positive proof of the two grand facts, the swallowing and the discharge of the snake, is still wanting. A glaringly obvious fact: nobody except the patient himself had witnessed either event. It is, at least, possible, that the snake presented to Dr. Mandt may have never entered or passed from the intestinal canal of Abraham Isajeff; but we must say, in justice to this thoroughly respectable physician, that no one who reads this interesting history, will be much disposed to doubt the facts as there related. There are, unfortunately, some rather obvious flaws to this reasoning. If we accept the unlikely premise that a snake would ever choose to enter a person’s mouth, and then succeed in getting to the stomach without first asphyxiating its human host, what would happen next? Snakes cannot live without oxygen, and in the human gastrointestinal tract would suffocate within a matter of minutes. It is wholly implausible that it would somehow survive for five days, as the patient and his doctors believed. The mundane truth is probably that this man was suffering from Munchausen syndrome or factitious disorder, in which patients fabricate the symptoms of some genuine – and often exotic – disease. It just goes to show that it’s scientific evidence that matters – not the reputation of the scientist.